One of the newer additions to the range, but already firmly cemented as a signature item, the Dark Stag Neck Brush is a thing of beauty. Elegant and refined, this tool elevates not just your barbering experience, but also your shop and station. The Neck Brush caught your eye? The Dark Stag Barber Neck Brush is an essential item in any barber’s toolkit. This Neck Brush moves away from the delicate, dainty neck brushes of the past, with the ring hook bases and spindle handles, to provide something sturdier and trustworthy. With a wide attachment point for the bristles, you know you can brush with ease and without worrying about losing the fine hairs in the process. The bristles are composed of our composite to maintain their shape over long term use and even when stored badly. This neck brush is another fantastic tool to add to your reliable, quality Dark Stag collection. 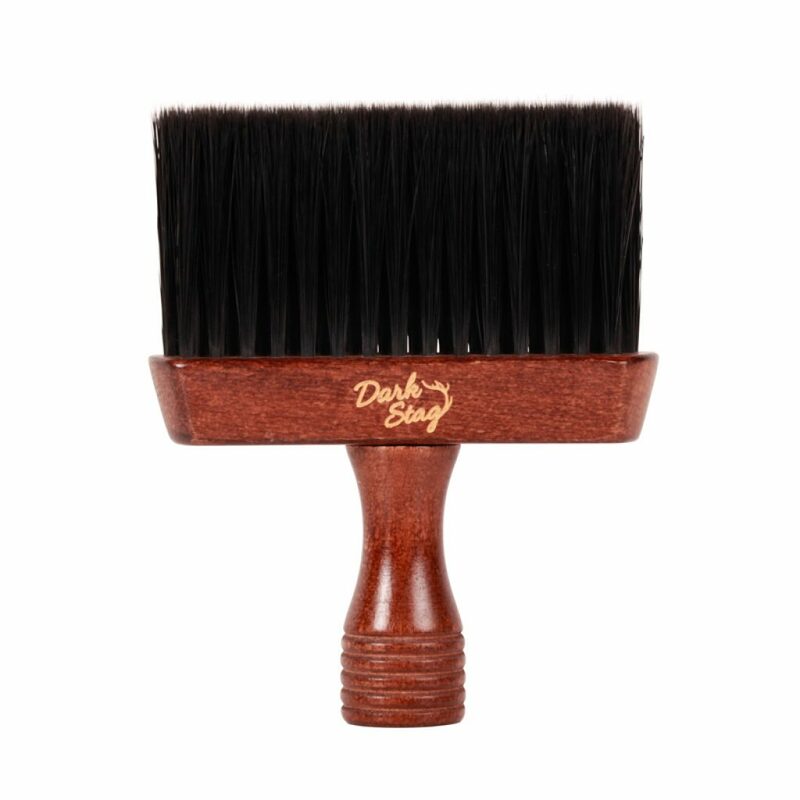 The Dark Stag Neck Brush is made with an elegant dark wood and uses extra soft bristles to effortlessly remove cut hair. The wood is fragrant, contrasting the solid sturdiness of the brush. With a wide attachment point for the bristles, you know you can brush with confidence. The neck brush has a round handle with a flat base, allowing the brush to stand upright at your station. Protecting it from unnecessary wear and tear. The extra fine, super soft bristles utilise a purpose designed memory composite. Maintaining their shape over long term use, even when stored badly. This is especially useful on busy days, or for the travelling barber who needs a tool he knows he can rely on. Wipe away any unwanted hair and complete your customers barber shop experience. The neck brush is sturdily built, yet ergonomically designed to provide a comfortable grip. Solid, yet not heavy. A stylish, traditional tool that will stand out in any barber shop! This tool is the perfect partner for our brushes and combs: the Dark Stag Fade Brush, Beard Brush, and Three Carbon Barber Comb Bundle! Get all of the stylish tools you need in one go! Want to read more? Why not learn more about the scissors you use?